With ever increasing participation every year, the seventh edition of the Hiranandani Thane Half Marathon (HTHM) saw an overwhelming response from marathoners and fitness enthusiasts from Thane, Mumbai and from and outside of Maharashtra. With ever increasing participation every year, the seventh edition of the Hiranandani Thane Half Marathon (HTHM) saw an overwhelming response from marathoners and fitness enthusiasts from Thane, Mumbai and from and outside of Maharashtra. Over 12,000 participants pounded the roads of Thane beating the chilling breeze of morning to participate in Thane's annual flagship event. Drawing such a magnanimous response, the Hiranandani Thane Half Marathon has become one of the prominent marathons of the country. Espousing the concept of 'Running for Expression', the Half Marathoner title for the 21.097 km run 2019 was clinched by Dinesh Kumar in stellar 1 hour and 09 minutes. Aarti Patil marked the title in the women category. Chandrakant Manwadkar became the winner for the 10 km run, while Poonam Sonudev bagged the 10 in female run title. The 'Green Run' of 10 kms saw Dharmendra Yadav and Poonam Sonudev bagging the winners' titles in the men and women categories; respectively. The 'Pillsbury Family Run' of 4 kms had Pandurang Chougule and Anjali Bhalinge as winners. Dr Niranjan Hiranandani who completed a 10 kms run successfully; thanked the participants for their overwhelming participation and making the marathon a success. "The purpose of the event is to promote Community Living, Holistic Living and Healthy Living,” said Dr. Niranjan Hiranandani-Founder & MD – Hiranandani Group. The Hiranandani Thane Half Marathon (HTHM) as an annual flagship event, allows participants to explore their multi-dimensional personalities, helping create better individuals that in turn create better communities, he added. The winners received the awards at the august hands of Mrs. Amruta Fadnavis, a social activist and other dignitaries such as Mr. Sanjeev Jaiswal, Commissioner, Thane Municipal Corporation, Mr. Sanjay Kelkar, MLA and others. Mrs Amruta Fadanvis lauded the spirit shown by participants and congratulated the winners. 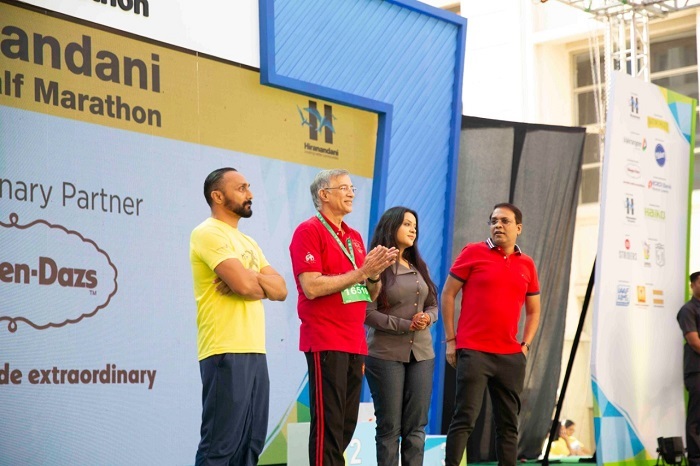 Actor and a celebrity marathon-runner Rahul Bose and Dr. Niranjan Hiranandani flagged-off the marathon at 5:45 am from the Hiranandani Estate, Thane (West). This year, the thought process took the event beyond, from just being a sport-related event through linking the fitness – conscious aspect with healthy individuals, in turn, creating better communities. Truly inclusive of all age groups, many senior citizens and children below 15 years of age also ran. A part of the registration fee collected from participants was donated to Mumbai Ashwamedh' and 'The Foundation', charitable institutions that carry out social causes.